TC Mag got its hands on photos of the MSI 990FXA-GD65, a Socket AM3+ motherboard with AMD's 990FX and SB950. The 990FXA-GD65 comes with full support for AMD FX Series (codename Zambezi) processors and packs goodies like Military Class components (Icy Chokes, Hi-c CAPs with a tantalum core and Solid CAPs), 10-phase DrMOS, APS (Active Phase Switching), and the OC Genie II function which allows for one-click/one second overclocking AND CPU core unlocking. 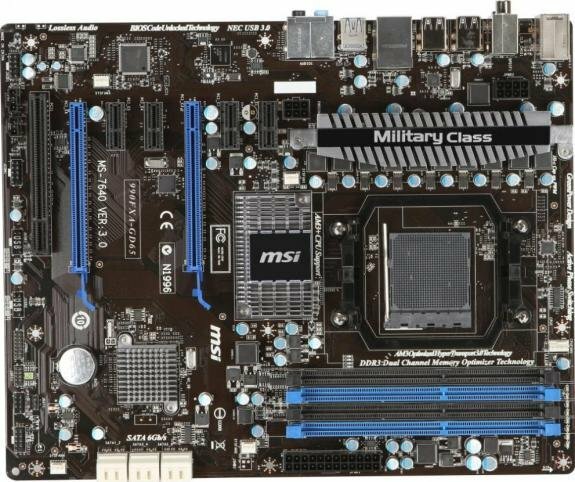 MSI's board also includes four DDR3-2133 memory slots, six SATA 6.0 Gbps ports, two PCI-Express x16 slots (SLI and CrossFireX are both supported), Click BIOS, Gigabit Ethernet, 7.1 channel audio, four USB 3.0 ports (two on the backpanel, two on-board via a header). The 990FXA-GD65 is currently listed on pre-order priced as low as €126.32.